Rackspace Public Cloud For WHMCS is a module that introduces centralized management and automated provisioning of cloud servers into your WHMCS. Our product enables your clients to order, supervise, and manage ready servers directly in your WHMCS client area. 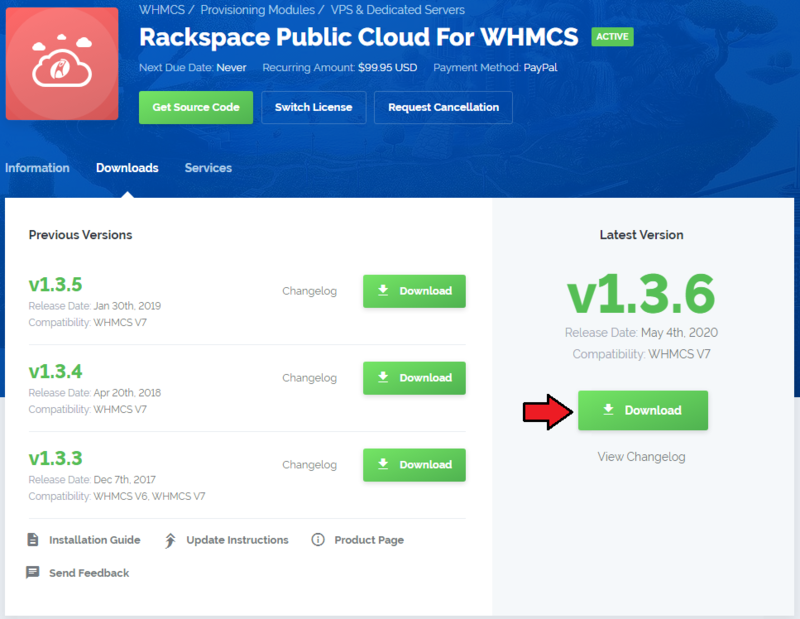 In this short tutorial we will show you how to successfully install Rackspace Public Cloud For WHMCS. Before you proceed, please make sure that you have the Rackspace Managed Cloud account and your API User account is active. 4. 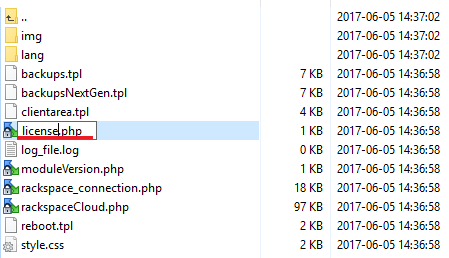 When you install Rackspace Public Cloud For WHMCS for the first time you have to rename 'license_RENAME.php' file. File is located in 'modules/servers/rackspaceCloud/license_RENAME.php'. Rename it from 'license_RENAME.php' to 'license.php'. 6. 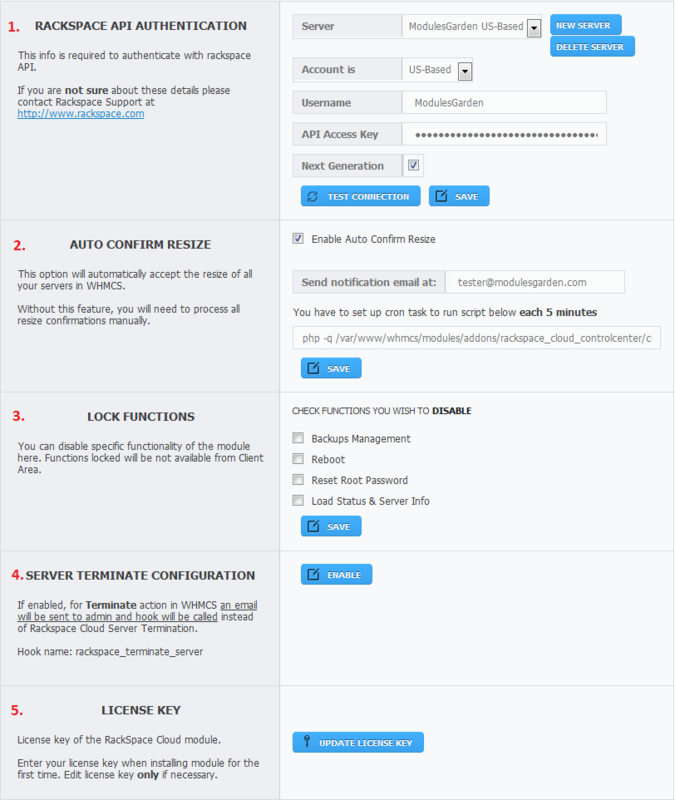 Login to your WHMCS admin area. Click 'Setup' then choose 'Addon Modules'. 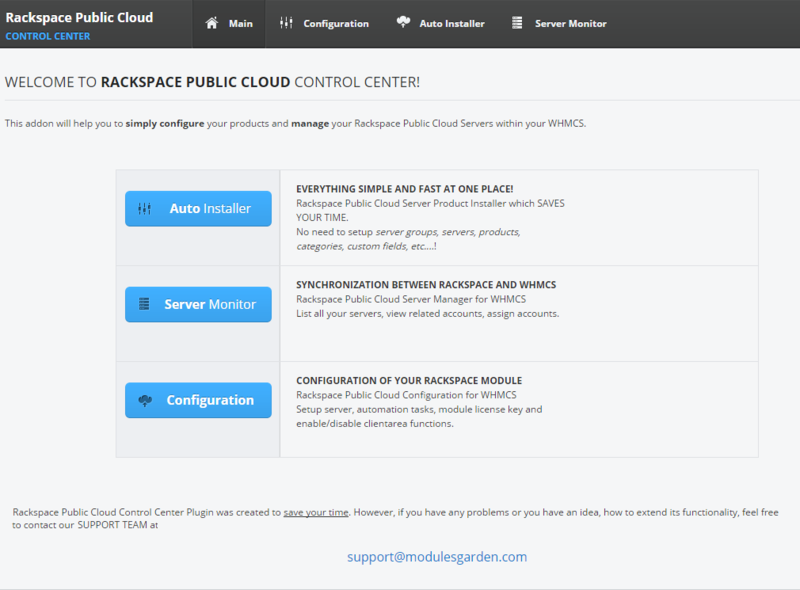 Next, find 'Rackspace Cloud' and press 'Activate' button. 7. Afterwards, press 'Configure' , tick 'Full Administrator' and press 'Save Changes'. 8. Go to your newly activated addon and assign privileges to your admin to access the module from 'Addons' → 'Rackspace Cloud'. Next, in configuration window you need to authenticate with Rackspace API. After you enter required data press 'Test Connection' button. If you see a green notification 'Login Successful', press 'Save'. 9. 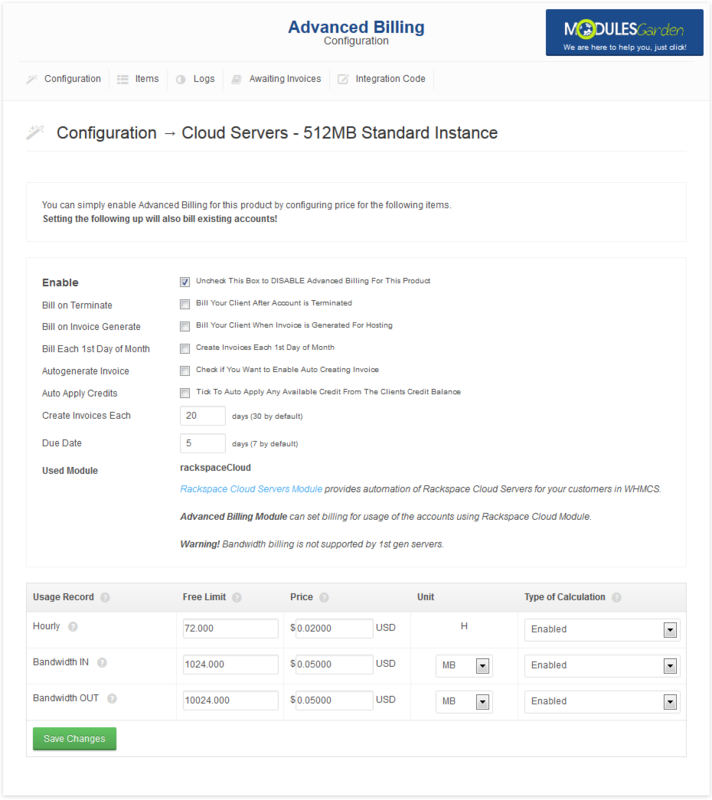 Now let's configure your Rackspace Public Cloud products in your WHMCS System. 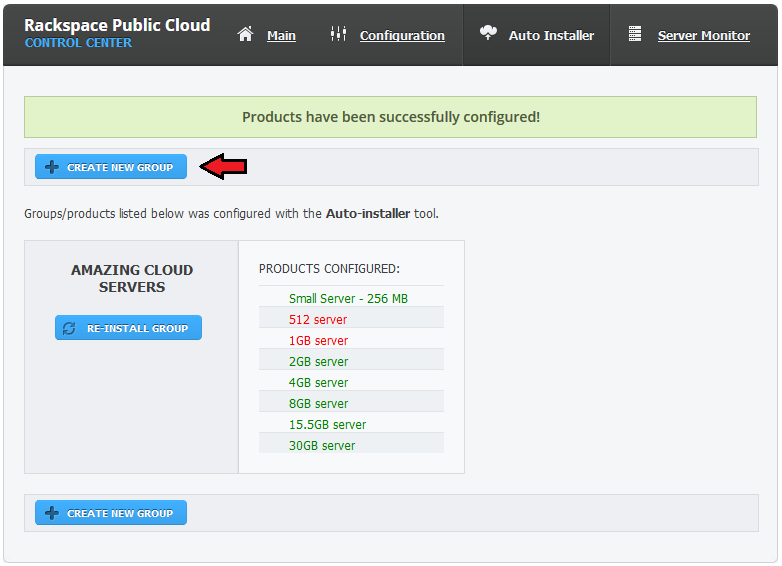 Choose 'Auto Installer' from the menu in Rackspace Cloud Control Center. Press 'Continue' and enter your products group name. 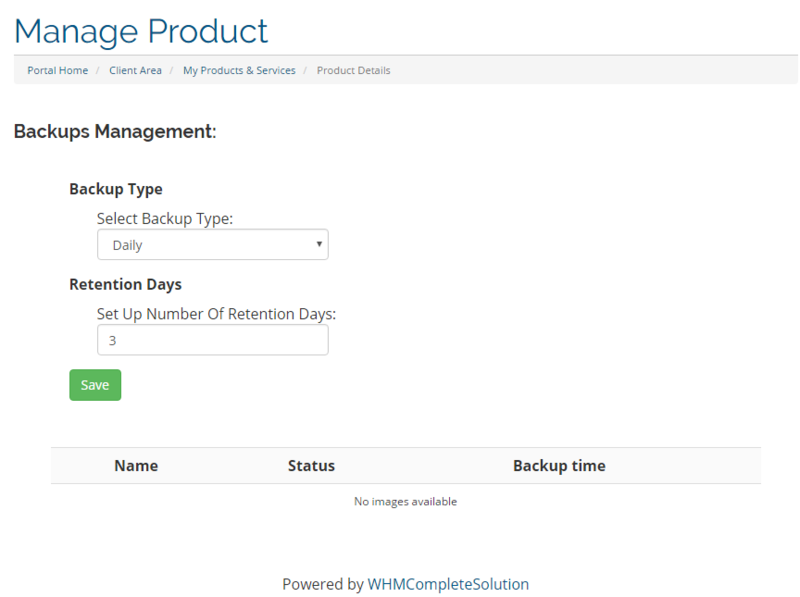 Now you can set up regular backups and images. Note that the following screen does not contain all available images. 10. The last step is setting up your products. 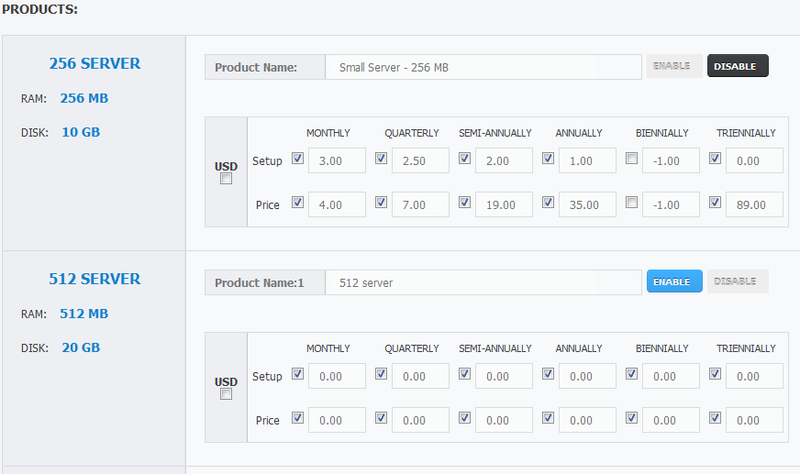 Here you can enable/disable particular servers and manage the pricing. For the purposes of presentation the '512 server' and '1GB server' have been disabled. Note: Following screen does not contain all available products. 11. After pressing 'Finish Configuration' you will see a screen as shown below. Congratulations! You have just successfully completed installation process of Rackspace Public Cloud products in your WHMCS system. 12. Now you can login to your WHMCS and check your products. Move to 'Setup' → 'Products/Services' → 'Products/Services'. 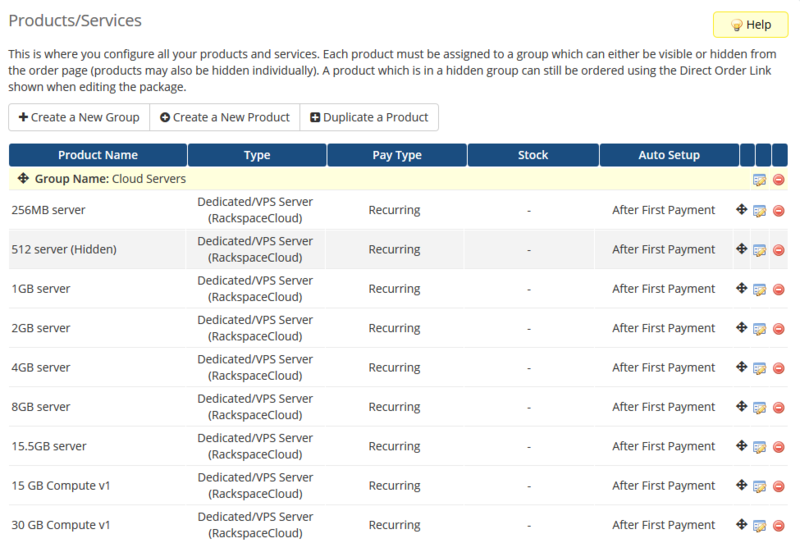 You will see a following screen which means that products have been successfully set up in your WHMCS. Good job! 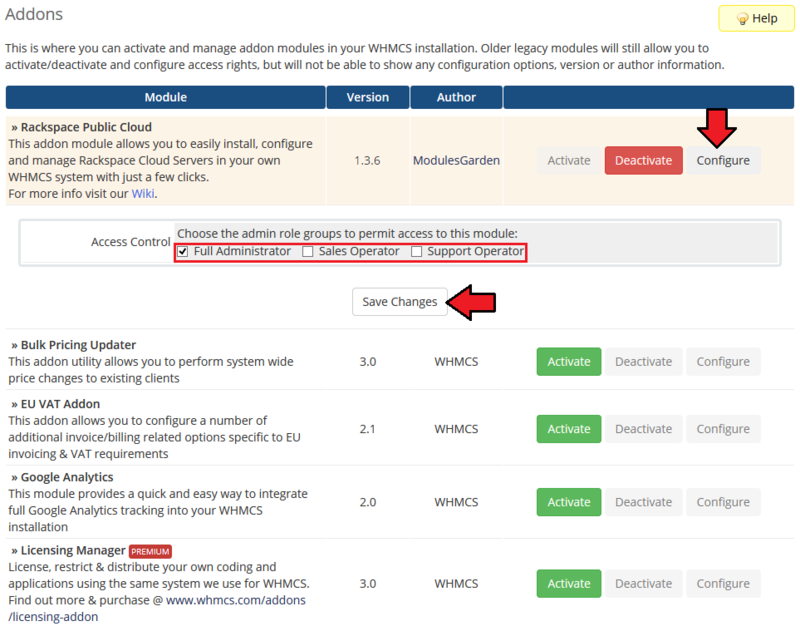 You have just installed and configured your Rackspace Public Cloud For WHMCS. Your Rackspace public Cloud is now ready to use. read the below sections to see how you can configure and the manage your products. Configuration of this module is very simple and intuitive. 1. 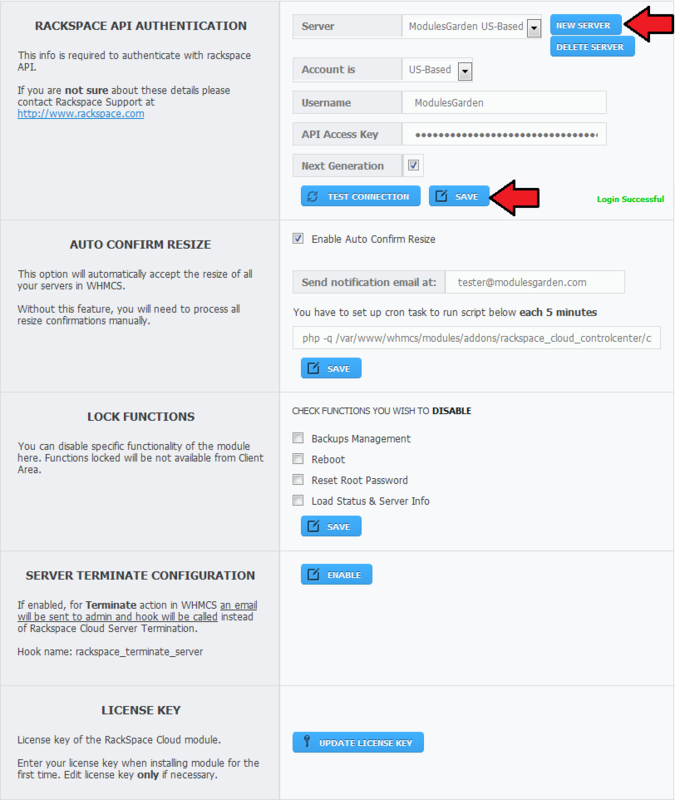 In Rackspace API Authentication section you need to provide your account base, username and API access key. 2. In order to enable 'Auto Confirm Resize' you will have to set up cron task to run the script. 3. You can disable specific functionality of the module like reboot or reset root password. 4. Here you can call a rackspace_terminate_server hook instead of Terminate action. Notification email will be sent to an admin. Our Auto Installer allows you to set up basic products options like names or pricing. 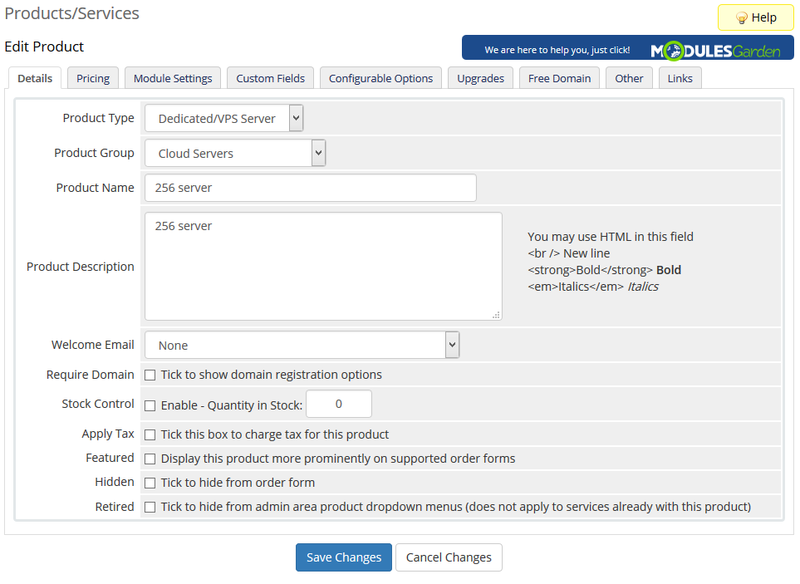 You can configure additional options of your products in your WHMCS. We will show you configuration on the example of '256 server' but you can obviously configure any of your servers. For this purpose choose 'Setup' → 'Products/Services' → 'Products/Services' and click on the icon as shown on the screen below. After you click the icon you will see the following screen. You can configure here everything you need. You can for example set a welcome email, configure pricing, set stock control, manage packages upgrades or enable auto termination. 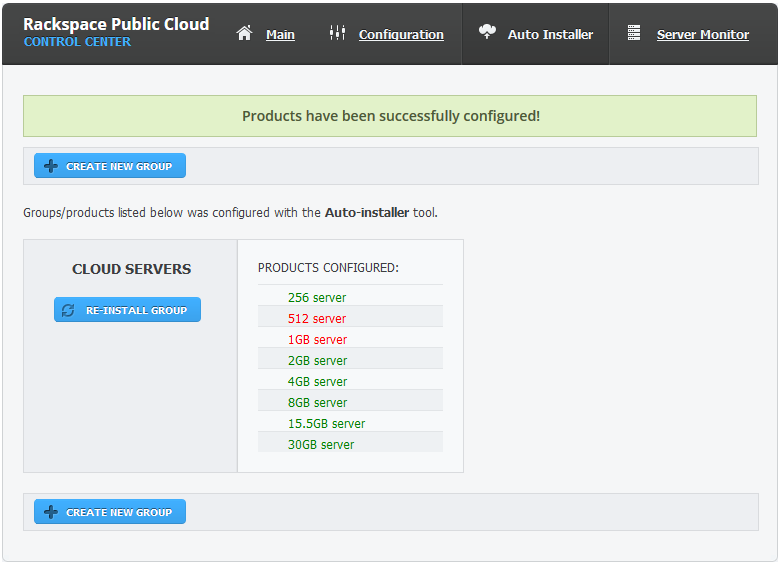 You can easily configure your products with just a few clicks with the use of our Auto Installer. 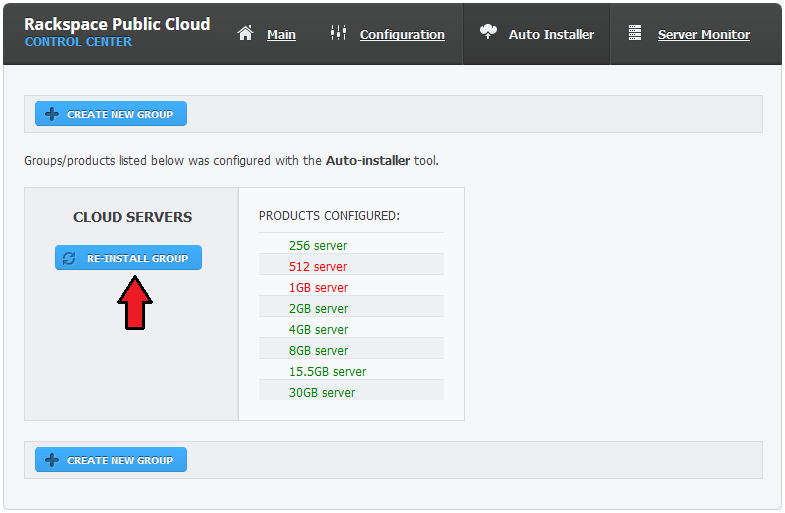 To do so click 'Auto Installer' in Rackspace Cloud Control Center and then click 'Re-Install Group'. In a very convenient way you can change here products group name, set up both regular backups and images and manage pricing. 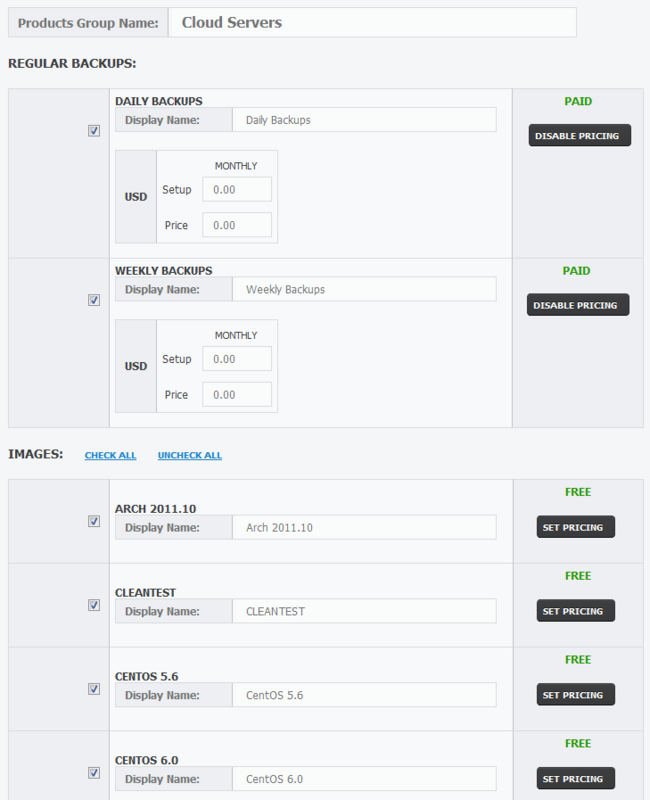 In the next step you can enable/disable particular products, change their names and set up pricing. Pressing framed icon on the screen below will reset pricing. After you press 'Finish Configuration' button, you will see a following screen with confirmation about successful configuration. If you would like to create a new group, simply click 'Create New Group'. 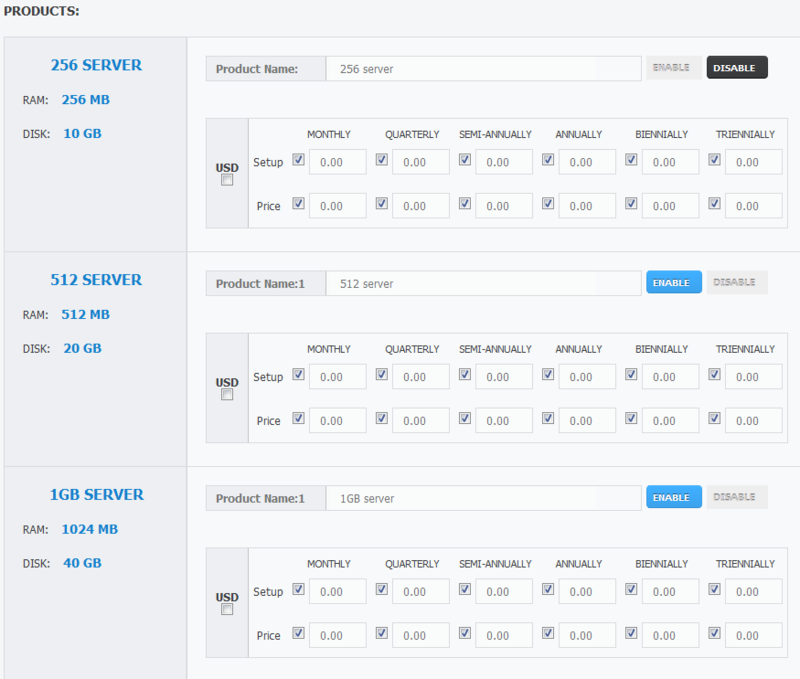 Server Monitor allows you to view and assign your servers. Please keep in mind that status update in Server Monitor is not instant. Sometimes you will need to wait a moment until the necessary updates are visible. Active accounts are being monitored thanks to configured synchronization of server in WHMCS with Rackspace. 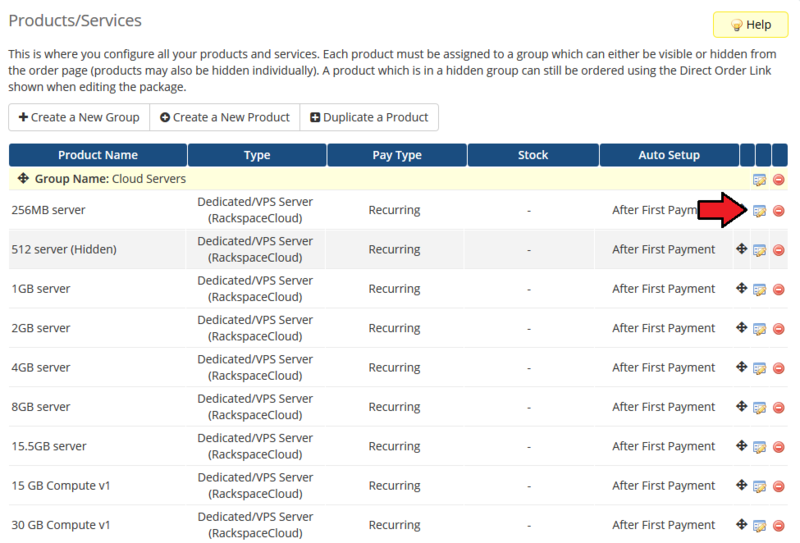 Here you can assign/reassign/unassign servers in WHMCS to the Rackspace servers. On the screen you can see active but unassigned server in WHMCS. Let's assign it to Rackspace server. To assign server in WHMCS to Rackspace server, simply press 'Assign' button and choose your Rackspace server from the dropdown menu. 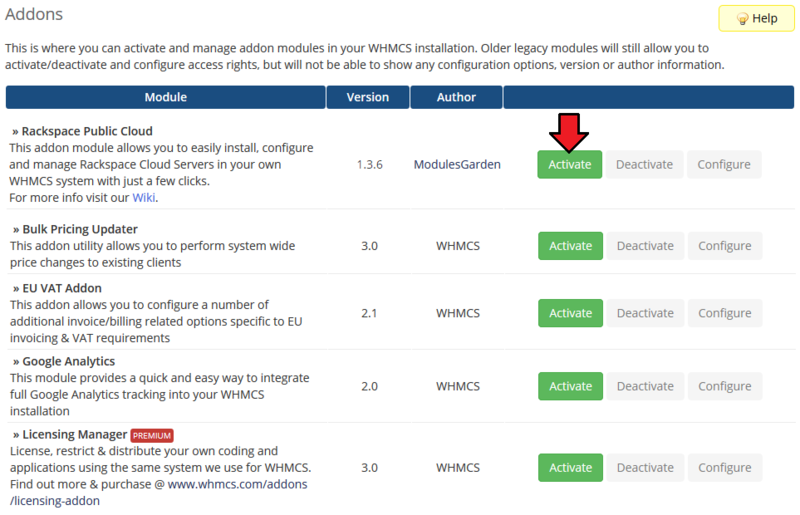 'Assign' means that WHMCS server ID field is linked correctly with Rackspace server owing to which customers have the full functionality in client area. You can manage your Rackspace server with ease in your client area. To do so login to your client area, then find and view details of your product. 1. You can check your server status here. 2. Immediately reboot your server from this panel. 3. By pressing 'Backups Management' you can set up your backups with just a few a clicks. 4. You can reset your root password here. Reboot server. Reboots are divided into soft reboot and hard reboot. 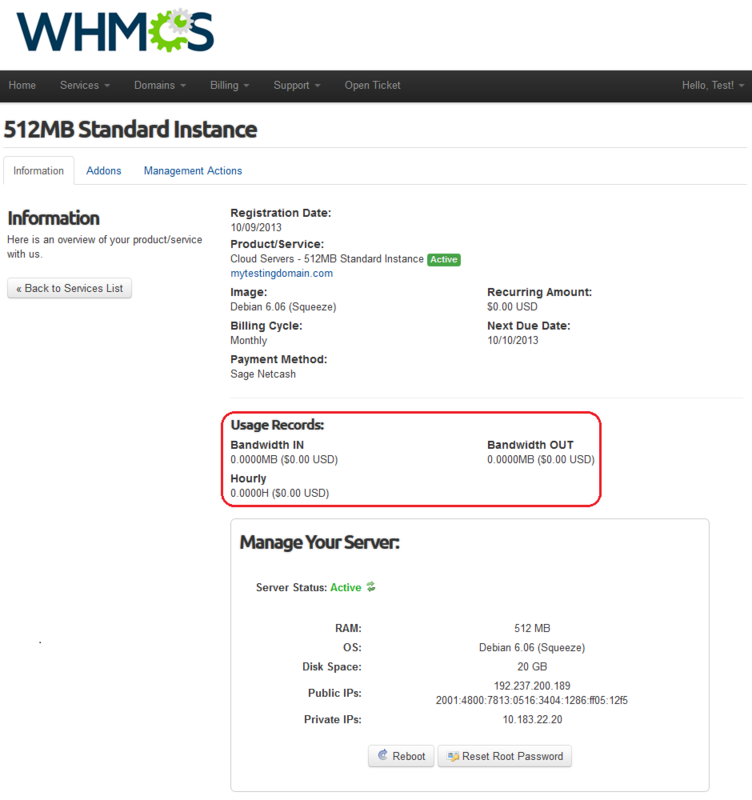 When you combine Rackspace Public Cloud For WHMCS with Advanced Billing For WHMCS, you will be able to set up additional billing options. 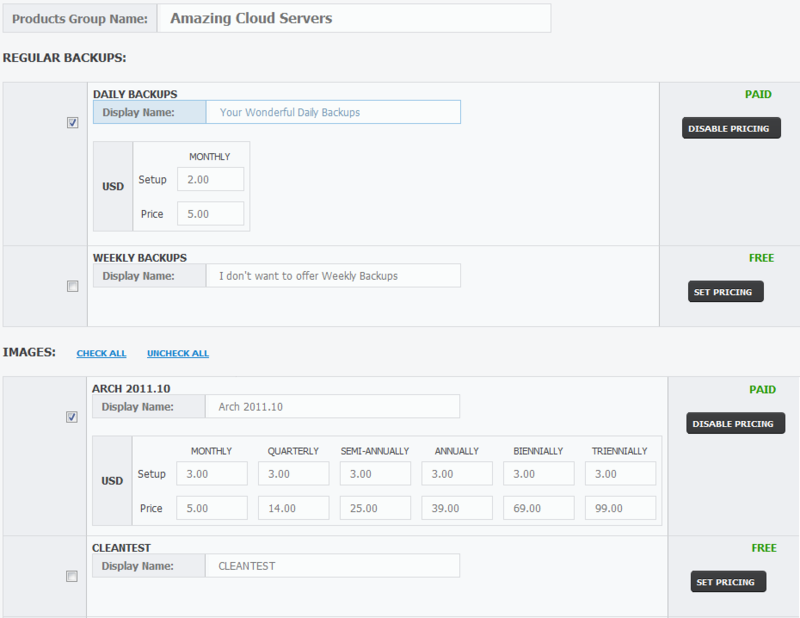 Module allows you to charge your customers basing on the server resources used by them. 1. 'Backups Management' functionality is not available for Rackspace next generation servers. 2. Bandwidth Billing Functionality works the same as Disk Space and Bandwidth Overage Billing. Here you can find more information how to configure it. 3. Bandwidth Billing Functionality works with Rackspace next generation servers only. 4. 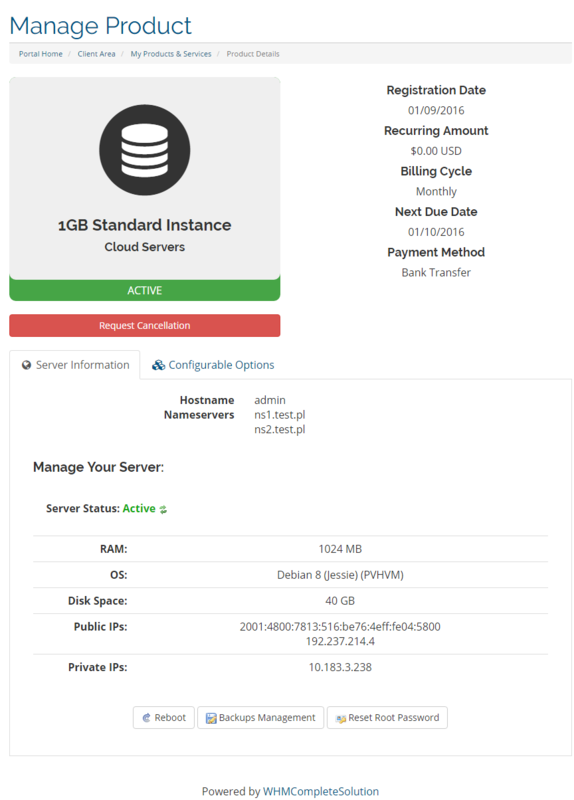 Bandwidth Billing Functionality is implemented inside the Rackspace Public Cloud For WHMCS module and it doesn't have external display place in the module interface. 5. Details of the server are updated only when the page is refreshed/loaded/reloaded. This operation is complex and requires 4 queries to the server, so when you refresh or reload a page 4 queries are sent to the server. 6. BW value is displayed in order page after running cron. 7. Your customers can view their current disk space usage and bandwidth usage at their client area in 'Product Details' section. 2. If, after installation, you get an ionCube encoder problem (wrong version), please open a support ticket. We will provide you with a different version of the module encrypted with the older version of ionCube. 3. The current version of our module allows to download servers only from Chicago (ORD location). It is not supported for other locations. This page was last modified on 11 March 2019, at 09:26.